This is a collection of simple watercolor paintings which help teach a beginner basic watercolor painting techniques. Often the difference between complex or difficult watercolor paintings is just the size of the artwork. The smaller you paint the easier you will find it when you are new to painting with watercolors. Here are some other points which make a watercolor painting easier to do. Limit the number of watercolor paints used. This means you can concentrate on tones and shapes rather than colors. Also reduce the variety of shapes in your watercolor painting. This makes it easier for you as you don’t have to concentrate so mach on your drawing skills. Nor will you have to try to quickly paint around complex shapes. All of the above points make a watercolor painting easier to do. Each point allows you to paint quicker. This reduces the chance of your paper drying too fast which is what usually causes beginner watercolor artists the most trouble. Often they are not even aware that this is the root cause of their problems. I hope you find these simple watercolor paintings useful. They are part of my beginners watercolor guide series. Painting the sea, clouds, skies, people, birds and sand. Uses wet on wet, wet on dry and dry brush watercolor techniques. 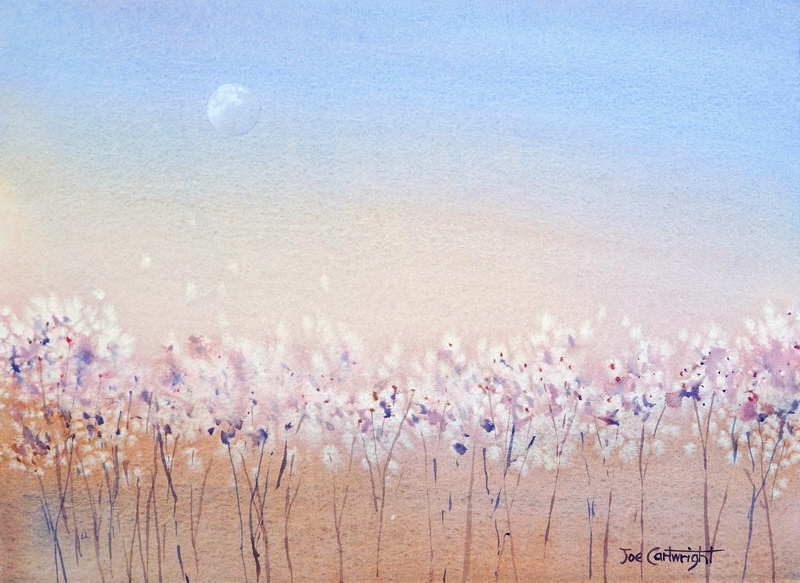 This simple watercolor painting uses limited pigments and is quite small. The shapes are kept quite simple as well. 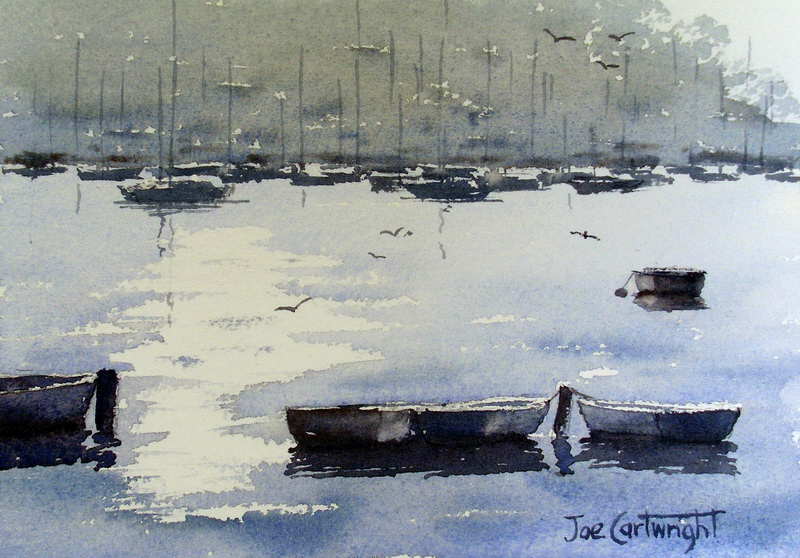 Small watercolor painting of row boats and simple sail boats. Brush techniques covered are wet on wet, wet on dry, and dry brush. Dry brush is used to paint the sparkle on water. Finished simple watercolor painting with salt demonstration. How to paint an easy watercolor painting using salt to create interesting textures. This is basically an exercise in using salt that was turned into a frame-able painting. I will be creating more simple watercolor paintings for the beginner. I hope you find the above watercolor demonstrations of use with your own work. Using candle wax and broad watercolor washes to produce this simple but effect painting. I’m a rank beginner, but I really enjoyed doing the 2-color beach scene. I’m a bit apprehensive about tackling the boat scene just yet. Looking forward to more “easy” beginner scenes from you. What a great site! 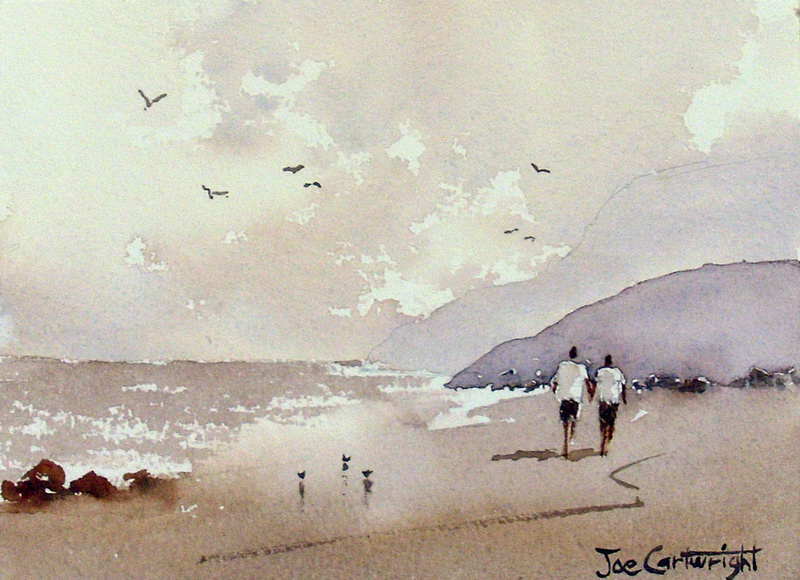 Just beginning and excited to try to the beach scene…love the simplicity! Thank you! This is EXACTLY what I want! I really like the techniques used for simple painting to start with. Thank you for taking the time to develop these easy watercolor lessons! I will try one this afternoon! I have been struggling with watercolor for quite some time. I think this is what I need. Back to basics. Thanks. Can’t wait to try beach scene this afternoon. I make simple greeting cards for friends. This is great.